A perfect, cost effective substitute for non-coffee drinkers. Each box is designed to be used as a display either in a cabinet, or on a cabinet top. Available in Regular AND Decaf. 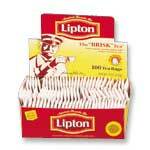 Lipton Tea, great name, great product. Regular comes in 100 count box, Decaf comes in 72 count.